This autonomous archipelago nation of the Kingdom of Denmark consists of 18 islands, all with a distinctive personality, that huddle in the North Atlantic. Roads thread through a dramatic, moody landscape of sheer cliffs, undulating hills dripping with waterfalls, cross-crossed by streams, and blanketed in green pastures. On Streymoy, one of the two largest isles, KOKS recently moved from the village of Kirkjubour to a new and much more convenient — but equally wild, rustic and remote — setting near the capital city of Torshavn. Their 18-course degustation menu — as well as the restaurant itself — is truly a celebration of the myriad sights, flavors and aromas that make the Faroe Islands an unforgettable destination. In fact, by dining at KOKS, it’s as if you’re being taken on a whirlwind tour of this precious archipelago that’s renowned for its pristine air, land and water. The native Faroese executive chef, Poulsen Andrias Ziska, pays tribute to the islands’ traditions, while embracing the New Nordic philosophy of cooking, relying on locally-sourced, including foraged, ingredients, and then elevating the dishes to an avant-garde level. (Since just about every Faroese village sits along the coast that runs for hundreds of miles, it shouldn’t be all that surprising to learn that fish, shellfish and other items from the surrounding waters make up a large part of the menu.) In addition, the citizenry has long relied on root vegetables (turnips and rhubarb) along with potatoes, as well as lamb that’s fermented in wooden drying huts for months on end, resulting in a strong flavor that’s prized. These treasured ingredients and cooking methods are important in KOKS’ menu that’s sustainable and changes seasonally. Diners staying in the capital will have no trouble finding a taxi driver to take them on the barely 30-minute drive to KOKS, a drive with not-to-be-missed scenery, especially during the seemingly endless summer days where day and night almost blend into one. Sheep in all different shades of black, white, brown, and gray graze beside the roads that curl through a desolate windswept expanse dotted with occasional charming dwellings that seem far outnumbered by the numerous waterfalls and streams. Eventually, the road narrows, turning to gravel, only to dead end at a wee, turf-roofed, black painted wooden shed that fronts scenic Lake Leynavatn. The multitude of slits in this traditional drying shed (for fish and meats) allows the salty air to blow through, something that’s essential for the fermentation process. A staff member will greet you, and, once inside, you’ll join other diners at a communal table, nibbling on a few appetizers (including fermented and dried lamb and whitefish) while sipping kombucha or artisanal beer. Then everyone hops in a four-wheel drive for an ultra-short, bumpy trip paralleling the placid lake along a dirt track that wanders over a black sand beach, crossing a small stream. Finally, in a setting that couldn’t be more magical, the restaurant comes into view: a centuries-old turf roofed, rugged basalt stone former farmhouse snuggled by verdant fields and hills carpeted in a brilliant green tapestry. Diners find candles, and flower arrangements made from foraged blossoms and branches of crowberry decorating each of the tables in the minimalist but cozy blond wood interior where sheepskin rugs are draped all about. This setting, however, does not linger in the past, instead easily melding the contemporary with the traditional. The modern dish ware and sculptures decorating the rooms are created by Gudrid Poulsen, a well-respected ceramicist who designed these exclusively for KOKS. Over the next three to four hours, even the most well-traveled guests will be surprised by the medley of dishes — and the complex flavor profiles — each with a unique presentation, often resembling a micro work of art. A raw scallop served with caramelized broth and roe is set on a bed of snail shells in a shallow wooden dish. Mahogany clam — it has a unique lifespan of hundreds of years — is accompanied by a jelly of kelp and puree of kale, topped with wintercress and placed atop weathered river stones in a lovely ceramic plate. A curved wooden plate holds a langoustine head stuffed with a tartar made from the tail and flavored with a cream from the brain. Beside it sits a bowl of fresh raw cow’s milk cheese plus fermented carrots. Even the palate cleanser is unique: a rhubarb compost with nasturtium is displayed atop a whitewashed ceramic cube. Steamed deep sea crab is served with a gel of fermented leek, grilled leek, sea sandwort, salted thongweed, and a side of crab foam made with Faroese elderflower. The codfish dish is really three dishes in one: Cod cheeks and throat are grilled and served with barbecue sauce; a bowl holds a foam made from smoked cod roe; and, set atop cod vertebrae in a lovely ceramic vase, is a sandwich of cod liver and fresh herbs spread between two thin cod skin wafers. Grass granita — yes, it’s made from grass — is drizzled with a sorrel sauce. Wild thyme ice cream sprinkled with crowberries is accompanied by a sauce of charcoal burnt cream. Cream is infused with dulse seaweed, crystalized chocolate, dried blueberries, and pickled thongweed. After having savored 18 courses, at close to midnight, I finally stepped outside, captivated by the magical pastiche of blue and gray hues overhead as the day still hung onto the night. My taxi was waiting to take me back to Torshavn, but I remained fixated on this rustic setting that seemed right out of a bucolic scene from Lord of the Rings. 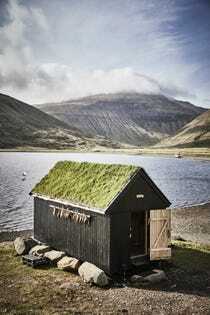 I knew I would hold dear the many hours of dining that literally embraced the heart and soul of the Faroe Islands.